Local artist GWEN SIMPSON has taken on a mammoth textiles project which highlights the true price of cheap high street fashion - and she wants the whole community to get involved during the Leigh Art Trail. Gwen’s mission is to make 1,130 textile pieces - one for each of the people killed when the Rana Plaza building in Bangladesh collapsed five years ago. Most of the dead were garment workers producing clothes for chains including Primark and Matalan. “There have been many tragedies in the textile industry, driven by our demand for cheaper clothing and the fast fashion business itself, but this was by far the deadliest to date,” said Gwen. To honour those who lost their lives and highlight the plight of millions more still subjected to shocking conditions as they make cut-price clothes for Western markets, Gwen is assembling a remarkable textile hanging which will measure 24ft x 9ft. 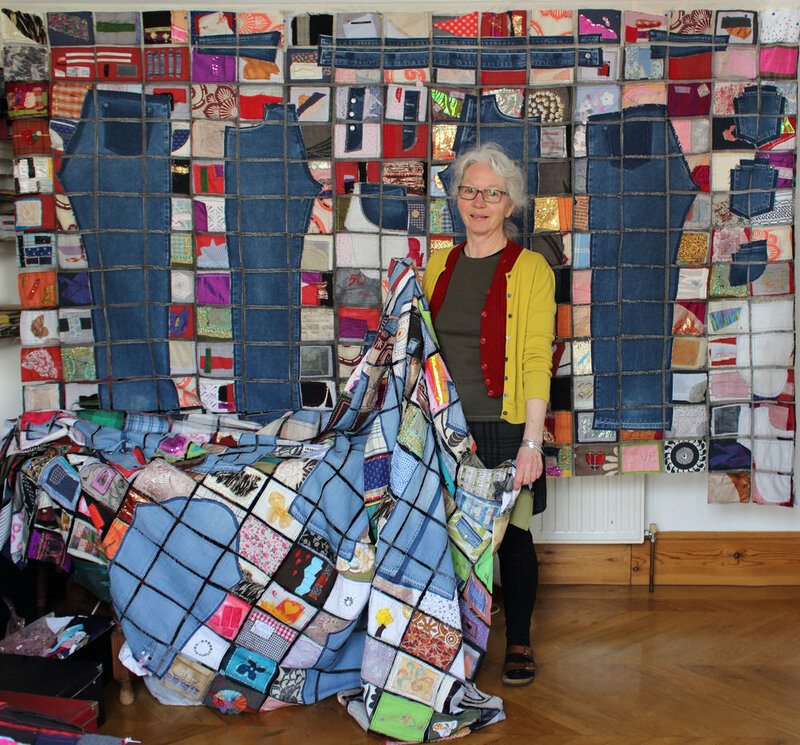 The centre-piece is deconstructed denim clothing, showing how many components go into a finished item, and now she wants members of the public to join her in stitching more than 1,000 patchwork pieces from recycled fabric to surround it. “People of all ages are welcome to participate, even if they have never used a needle and thread,” said Gwen, who found she had a flair for making her own clothes when she was an art student. It is hoped the finished hanging will be displayed at the prestigious 2019 Festival of Quilts in Birmingham, before it is sold to raise money for children orphaned by the Rana Plaza disaster. Gwen is running workshops for her Connecting Threads project during the Leigh Art Trail at Leigh Road Baptist Church (Monday June 11, 9.30am-3pm and Wednesday June 13, 7pm-10pm), Wesley Methodist Church (Wednesday June 13, 10am-2pm) and Leigh Community Centre (Saturday June 16, 10am-2pm). Gwen’s work in progress will be displayed at Leigh Road Baptist Church, Marguerite Drive, Leigh-on-Sea, during the Leigh Art Trail. Images available, please make contact.